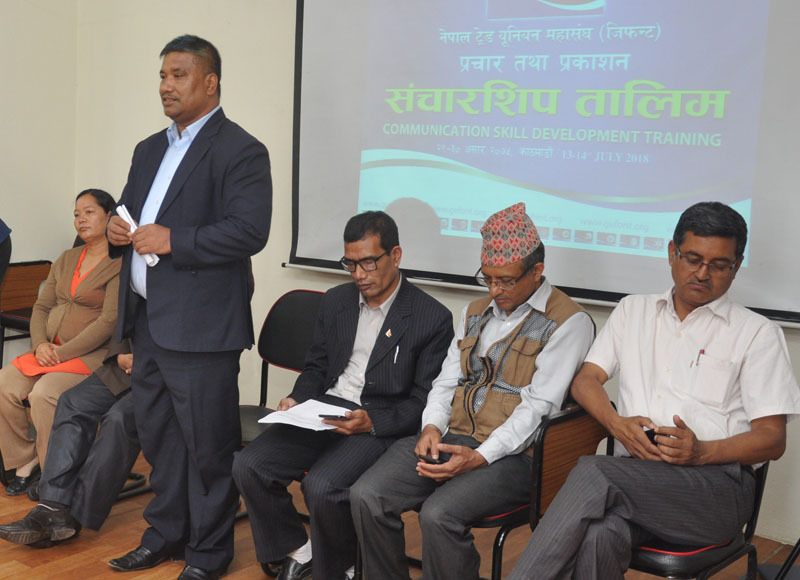 GEFONT has organised a two days Communication Skill Development Training. Representatives of various GEFONT Affiliates and GEFONT Province Committees had participated in the Training. Inaugurating the Training, GEFONT President Binod Shrestha said that “​GEFONT efforts have made significant changes in Labour Market.” He informed that GEFONT has played vital role to adopt Labour Law & Social Security Act and for the effective implementation of Laws, need to create awareness among workers . He further said that “Currently second generation has been leading the GEFONT and we are preparing third generation leadership. In the changing context, we need members with the expertise in specific issues.” He expected that the training will be fruitful to upgrade communication skill of the participant. Throughout the training period, Vice President Jitendra Shrestha, Secretary General Janak Chaudhary, GEFONT Publicity and Publication Team Members - Mahendra Shrestha, Kiran Mali and Sunil Neupane trained 28 participants. Participants were trained on GEFONT Policy and Programme, about news writing & reading, importance of good photography, about GEFONT website, proper use of social network etc. During the closing Ceremony, GEFONT Vice President Jitendra Shrestha informed that GEFONT will organise similar type of training in future. Likewise, Secretary General suggested all participants to implement knowledge gain from the training and publicize the activities of their Unions. On behalf of Participants, Rajkumar Shrestha and Pabi Gurung expressed about the advantage of training.